The Telegraph December 1, 1908. 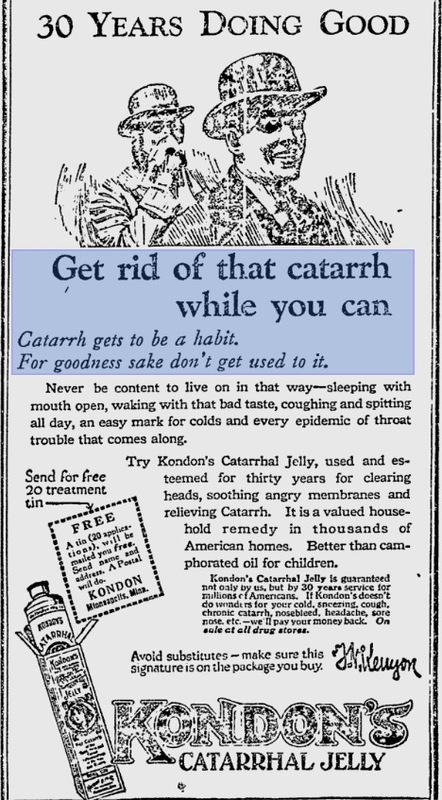 This was yet another example of an early twentieth century product claiming to cure the complications of catarrh: headaches, sore throat, and even deafness. Catarrh, if you’re unaware, is an unpleasant nasal congestion with an excess build-up of mucus in the throat, nose, ears, or chest. It usually follows after persistent cold or flu; and as colds and flus affect people differently, so too does catarrh. Some people’s symptoms go away after a few days while others remain plagued for a few years. Some nineteenth-century aurists explained the cause of catarrh as owing to a defect in the Eustachian tubes, which connects the middle ear to the pharynx. Fluid can build up there, thus accounting for excessive mucus in the ear and temporary deafness that occurred in some patients. Decongestants, air pumps, syringing, were recommended as treatments. By the turn of the century, patent medicine in America became widespread through advertisements. 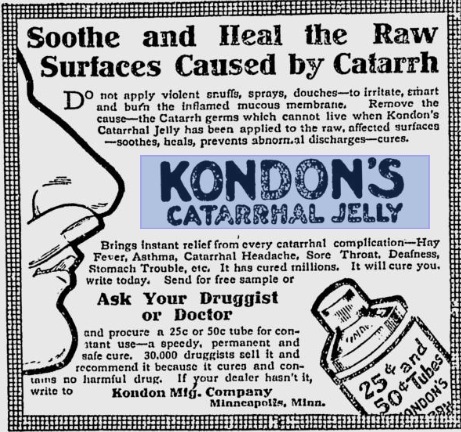 Which leads me back to the advert I came across, for Kondon’s Catarrhal Jelly, which I’ve never heard of before. Naturally, I started digging into the product to uncover its history: was it a reputable product or another patented medicine propagated by a “quack” boasting of its ineffectiveness? The advert indicates the product was manufactured in Minneapolis, Minnesota. 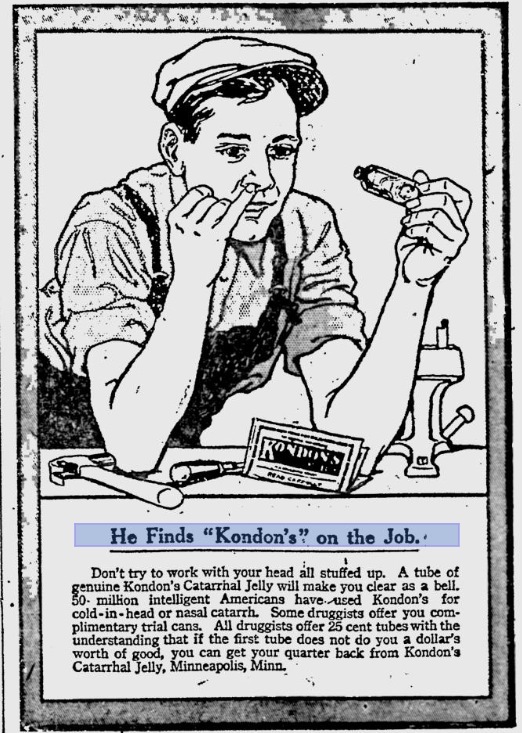 So, off I searched for the Minnesota archives and found a bio of one Thomas N. Kenyon (1863-1935), the owner of the Kondon Manufacturing Company, which produced proprietary medicine in Minneapolis. Kenyon worked on a farm in New York state until he arrived to Minneapolis in 1882 and worked in a grocery store, eventually moving up as a traveling salesman for Frederick F. Ingram, drug specialist of Detroit. 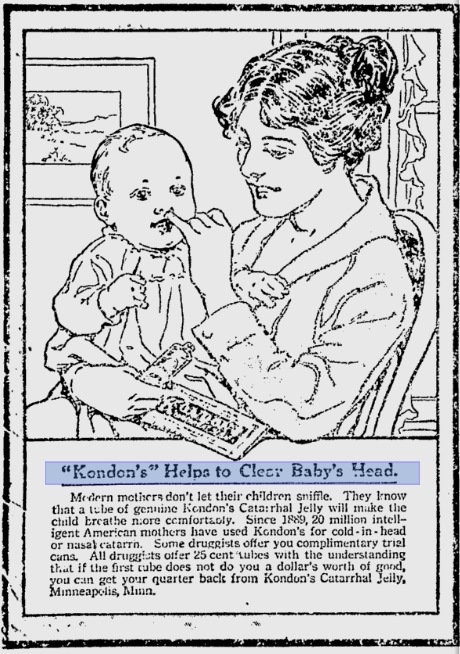 Around the late 1890s, he developed Kondon’s Catarrhal Jelly. Since that time he has steadily increased his appropriation among the prominent dallies of the east and middle west. He is thoroughly systematic in his advertising and a firm believer in concentration…The success he has achieved, while in a great measure due to hard work and judicious advertising, could never have been accomplished without the backing of merit. The Jelly was widely recognized throughout North America and England. Kenyon’s life is grand with tales. He worked as the Director of the Minneapolis National Bank, he collected cars and driving horses, and apparently a domestic servant employed in his house was charged with insanity after she contemplated suicide following an unhappy love affair. 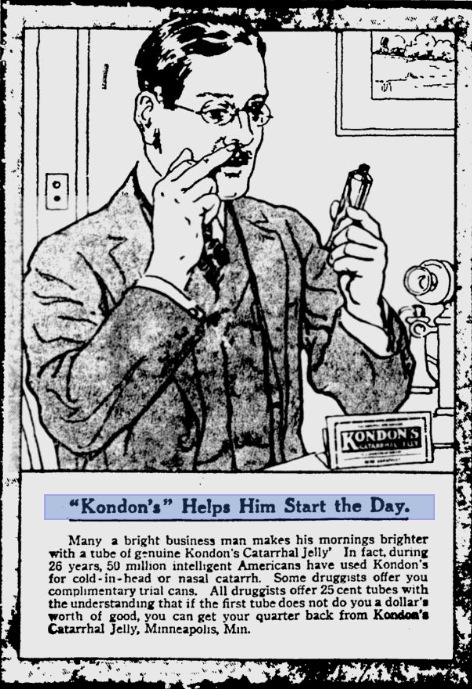 I searched through google newspaper archives quickly for more Kondon’s advertisements and came across this series from 1917. Clearly these ads depict how easy and versatile the product is, for a variety of everyday settings. Here’s another advert I found that highlights the longevity –and hence, general trustworthiness–of the company and product. Advertisements between 1930 and 1932 were overseen by the Mac Martin Advertising Company, a prominent figure in the advertising community of Minneapolis. Rev. Marion Daniel Shutter, History of Minneapolis, Gateway to the Northwest Volume III (Chicago & Minneapolis: The S.J. Clarke Publishing Co., 1923), 450-453. Meriden Morning Record October 6, 1908.